When I’m out on the road, and life has settled down a bit, I’m really going to enjoy having time to cook. After all, one of the primary goals to living in the RV is to live a healthier life, and cooking real food seems like a novel idea towards that end. Right now I don’t spend much time cooking because it seems like it takes a long time and it always feels like there’s something else, something “better” I should be doing. I can’t wait to have the free time so it doesn’t feel like I’m under that burden anymore. 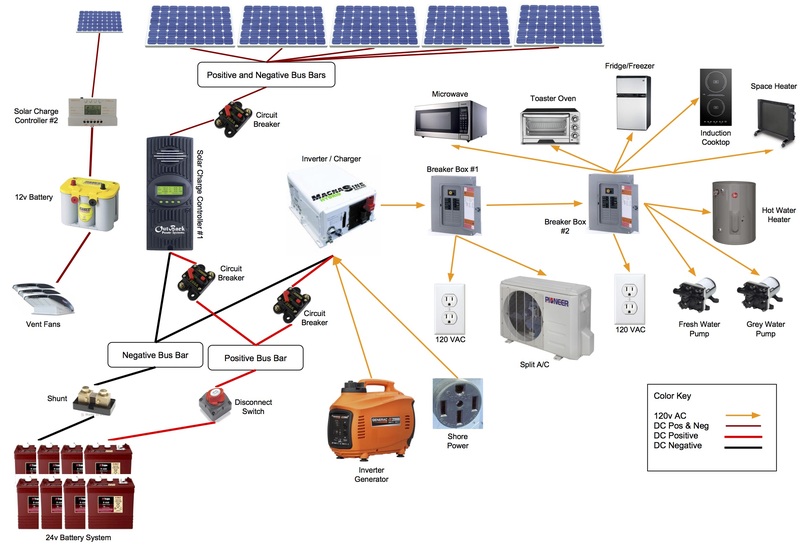 The image above (larger version) shows the major concepts of the electrical system I’m planning on building into my RV. Woo hoo! I’ve signed the purchase agreement and paid the deposit for my new trailer! The total for the trailer came out to $19,474 + 5.5% tax = $20,545.07. I’ve just wire-transferred one half of the pre-tax amount ($9,737) to Becker Custom Trailers. Continue reading Deposit Paid! Posted on October 14, 2016 October 19, 2016 Categories ProgressLeave a comment on Deposit Paid!